painful experience for any mother. Philippines has to endure this misery. country. “I suggested to my husband that he should find a job abroad so we can give a better future to our two children,” she recalls. take the risk of leaving his comfortable home. her daughter, Jade, a mere 11 months old. “She did not want me to leave her. She was just a toddler who needed her mother’s love. Less than a year later, she learned that her husband had abandoned her and their two children for another woman. 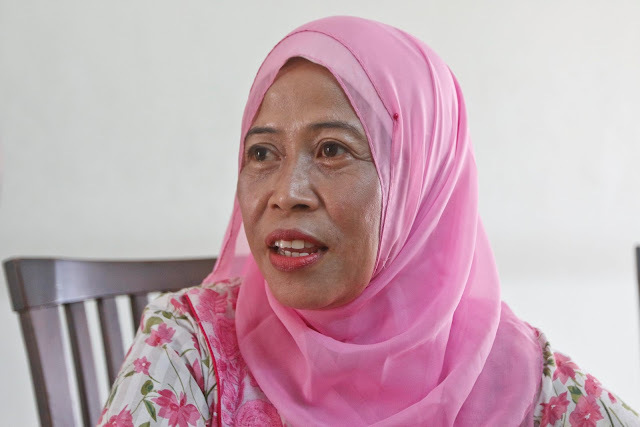 Because her first employer did not allow her to own a handphone, Lhea says she was only allowed to call home and speak to her children for only 15 minutes once a month. For the last few years, Lhea has been a freelance maid, working for several houses. “I have the flexibility to call my children anytime I want,” she says. The first time she returned home was in 2015, after having been away for 10 years working in Malaysia. “When I arrived at the airport in Manila, I recognised my son immediately,” she recalls. “I asked my son where his sister was and he pointed to a young girl who was standing next to him. Endang Setiwati, 48, from Semarang in Indonesia, was in a similar predicament. Nine years ago, her husband left her and she was left to fend for herself and their four children. 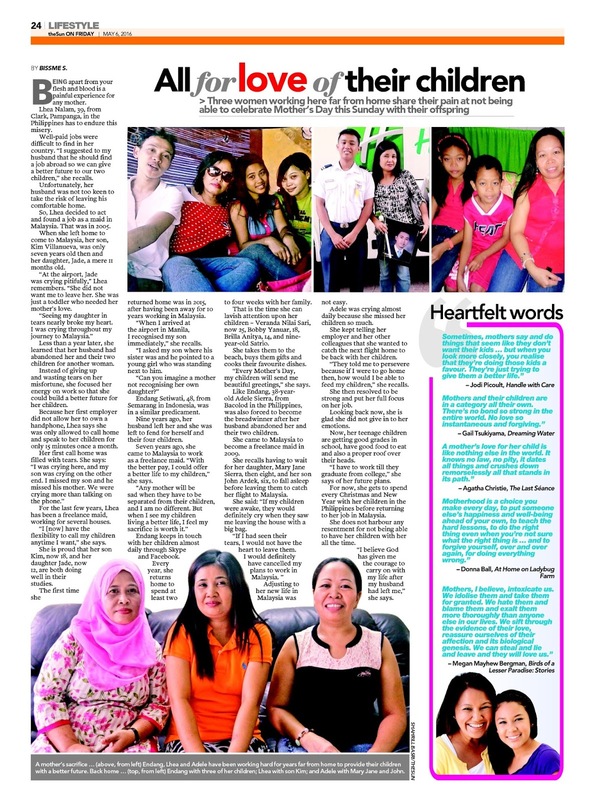 Seven years ago, she came to Malaysia to work as a freelance maid. “With the better pay, I could offer a better life to my children,” she says. Endang keeps in touch with her children almost daily through Skype and Facebook. Every year, she returns home to spend at least two to four weeks with her family. That is the time she can lavish attention upon her children – Veranda Nilai Sari, now 25, Bobby Yanuar, 18, Brilla Anitya, 14, and nineyear-old Satrio. She takes them to the beach, buys them gifts and cooks their favourite dishes. “Every Mother’s Day, my children will send me beautiful greetings,” she says. 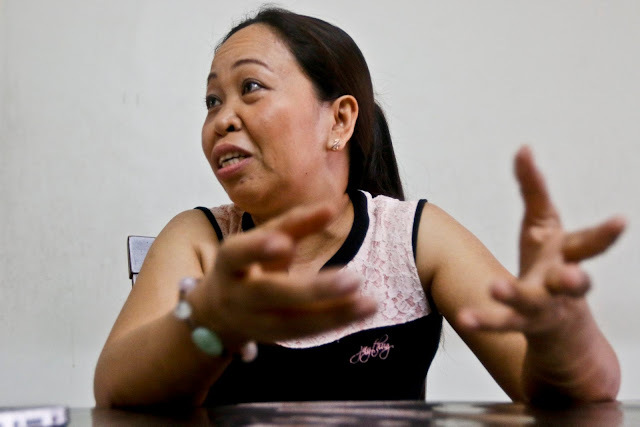 Like Endang, 38-year-old Adele Sierra, from Bacolod in the Philippines, was also forced to become the breadwinner after her husband abandoned her and their two children. She came to Malaysia to become a freelance maid in 2009. 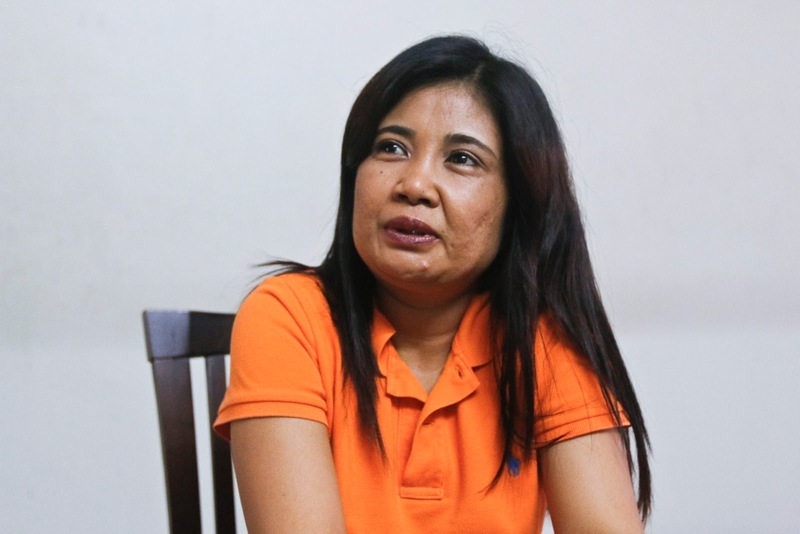 She recalls having to wait for her daughter, Mary Jane Sierra, then eight, and her son John Ardek, six, to fall asleep before leaving them to catch her flight to Malaysia. She said: “If my children were awake, they would definitely cry when they saw me leaving the house with a big bag. Adjusting to her new life in Malaysia was not easy. Adele was crying almost daily because she missed her children so much. She kept telling her employer and her other colleagues that she wanted to catch the next flight home to be back with her children. “They told me to persevere because if I were to go home then, how would I be able to feed my children,” she recalls. She then resolved to be strong and put her full focus on her job. Looking back now, she is glad she did not give in to her emotions. Now, her teenage children are getting good grades in school, have good food to eat and also a proper roof over their heads. “I have to work till they graduate from college,” she says of her future plans. For now, she gets to spend every Christmas and New Year with her children in the Philippines before returning to her job in Malaysia. She does not harbour any resentment for not being able to have her children with her all the time.